-UHF wireless ID pairing technology,support 10 variable channels,and support multiple sets using in a band simultaneous. -Professional 5 guitar effects:original clean,bluesy,flanger,tremolo,metal.You are certain to love it. 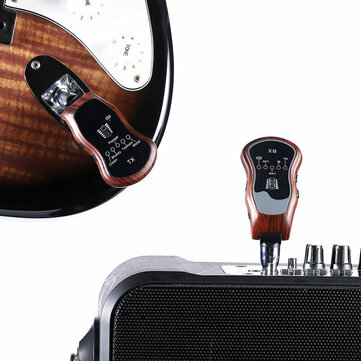 -The TX has built-in amplifiers,it can connect earphone or speakers to work independently by D3.5 output,and can be played anytime and anywhere,especially suitable for warm-up exercise before live show. -The TX supports power saving function.It will be turned off automatically if there is no inputsignal more than 5 minutes,making it more environmentally friendly. -The RX built-in BT and line-in,background music of mobilephone can input to RXthrough it.So that one musician could play the effects of a band. -Applicable field:portable guitar exercise,warm-up exercises before show,etc. Suitable Musical Instruments: Electric Guitar, Electric Guitar with pickup, etc.